Martin Gilbert’s spontaneity was part of his charm. 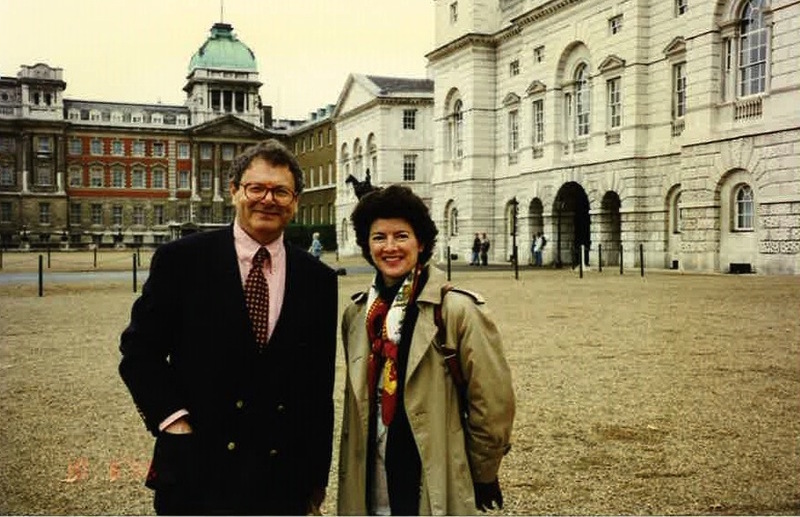 Here he is with good friend Jacqueline Dean Witter on our 1996 Churchill’s England tour, where he led fifty people on a fast-paced walkabout in London. The venue is Horse Guards Parade, with Churchill’s Admiralty in the background. Man­ches­ter vs. Gilbert is excerpt­ed from a longer piece which can read in entire­ty on the Hills­dale Col­lege Churchill Project. I’ve been slog­ging through the William Man­ches­ter Churchill tril­o­gy, The Last Lion. How is Hillsdale’s eight vol­ume Win­ston S. Churchill by Ran­dolph Churchill and Mar­tin Gilbert dif­fer­ent? —M.A., Louisiana. If you are slog­ging through Man­ches­ter, you may find Gilbert a chal­lenge. There is a vast dif­fer­ence, both writ­ers have their advan­tages, but Gilbert is the source on which schol­ars rely.